Things to do in Limerick – There is always something to do in Limerick which is virtually bursting with fascinating historic sights, wonderful old pubs, fashionable bars, glossy shops, smart restaurants, good transport links and numerous sleeping options. Whether you are a fan of theatre, opera, ballet, modern dance or something more active like horse, racing, rugby, Gaelic football or hurling Limerick city offers these in abundance. As well as the internationally renowned Hunt Museum with its exceptional art collection including works from Picasso, da Vinci and Renoir, Limerick also boasts a wonderful medieval precinct with the famous 800-year-old King John’s Castle and St Mary’s Cathedral. Conquered by the Vikings in the ninth century, this bustling modern city has a rich medieval past, which resounds around its ancient streets. With almost 50 per cent of the population under the age of 30, Limerick is a vibrant, living, cosmopolitan city. The city boats a compelling menu of festivals and events throughout the year including the internationally renowned EV+A exhibition, the St Patrick’s Festival, Riverfest and the Limerick Pride Festival. 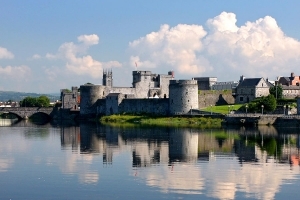 Limerick makes a great base for exploring the excellent surrounding sights and is just a 15 minute drive from Shannon International Airport.